Because the Island of Greenland is geographically shaped like the head of a bear, wolf or fox, its silhouette appears to only have one eye. . This shape is coincidentally replicated in the shape of southern Texas with Austin, Texas, representing the eye of the bear. The single eye is symbolic of the blindness that Greenland suffers for it is cut-off from the underworld, relying completely on the CIA of Switzerland for its survival. The one-eyed Beast of Greenland is most commonly depicted as the Eye of Providence (i.e., the All-Seeing Eye of G.O.D., otherwise known as Greenland of Denmark). The Eye of Providence and the Bear of Greenland is coincidentally found on the flag of Šiauliai, the fourth largest city in Lithuania. In Norse Mythology, the god of Odin, who coincidentally only has one eye, goes by the name of “Battle Wolf” and “Bear”, both tributes to Greenland. The Biblical “Number of the Beast” (i.e., 666) also appears to be a direct reference to Greenland as the Holy Bible is the allegorical and metaphorical history book of the Greco-Roman Empire. The term “Beast” (B+S+T) was evidently derived from the term “Best” (B+S+T) which is why Greenland was chosen as the home of the Greco-Roman Empire. The Mesopotamian god Ugallu, is known as the “Big Weather-Beast”, for the “Ugallu” (G+L) acronymically equates to Greenland. 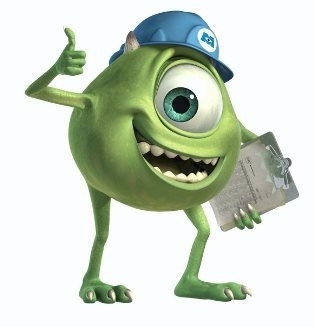 Lastly, in Disney’s Monsters, Inc., the character known as "Mike Wazowski" is depicted as a one-eyed green monster, a modern tribute to the Beast of Greenland. The term “Bear” (B+R) is constructed by the acronyms of “Babylon” and “Rome”, the former capital city and name of the Greco-Roman Empire. Since Greenland resides above or over the Earth (i.e., in heaven), the German word “über” (B+R) translates to “above”, “over” and “across”. The Bear of Greenland is flanked by Bermuda Triangle in the Atlantic Ocean and the Bering Strait in the Pacific Ocean. Boreas (B+R+S), meaning "Devouring One", was the Greek god of the cold north wind, Aurora, was the Roman goddess of the dawn. Consequently, the Arora Borealis (B+R+L+S) are the Northern Lights which shine upon the Bear of Greenland. Aside from the god of Odin who goes by “Bear”, Búri (B+R) was the first Norse god in Norse mythology who became the father of the other gods, including Borr (B+R), a god who had three sons, Odin, Vili and Vé. The names of these metaphorical sons are deciphered as follows: “Odin” (D+N) represents the third and final den (home) of the Greco-Roman Empire in Greenland; “Vili” (V+L) represents the veil of secrecy which allows the Roman Empire to thrive unabated in Greenland, until now; and “Vé” (V) is an acronym for Victoria, the Roman goddess of victory. Lastly, Britannia (B+R+T+N) the female personification of England, while Hibernia (H+B+R+N) the female personification of Ireland, both of which have the “Bear” (B+R) of Greenland within their respective names. Because a bear, wolfs or fox must have a den to live in, the term “Den” (D+N) has become synonymous with Greenland. Since the Romans were the first to invent gunpowder and “Dynamite” (D+N+M+T), it was give the name of “Den Might” for it represented the power of the Greco-Roman Empire in Greenland. Tributes to the “Den” of Greenland are found throughout popular culture, including but not limited to: Business: Denny’s; Denner; Celebrities: Dan Rather; Harry Houdini; James Dean; John Madden; Joe Biden, Madonna; Michael Jordan; and Princess Diana; Culture: “Danny Boy”; Mythology: Odin, a god in Norse Mythology; Tuesday: Middle Low German (Dingesdag); German (Dienstag); Dutch (dinsdag); Afrikaans (Dinsdag); Thursday: Proto Germanic (Þunras dagaz); Old English (Þunresdæg); Old High German (Donarestag); Middle Low German (Donersdag); German (Donnerstag); Dutch (donderdag); Afrikaans (Donderdag); Wednesday: Proto Germanic (Wōdanas dagaz); Old English (Wōdnesdæg); Old Saxon (Wôdanesdag); Old High German (Wôdanstag/Wuotanstag); Middle Low German (Wodenesdag); Scottish (Wadensday); and Words: condone; Dan; Danish; dance; dandelion; dawn; dean; den; dentist; Dianetics; dine; dinner; dinosaur; don; done; donate; done; donner kebap; don’t; dune; dynamic; dynasty; dynamite; and Great Dane. 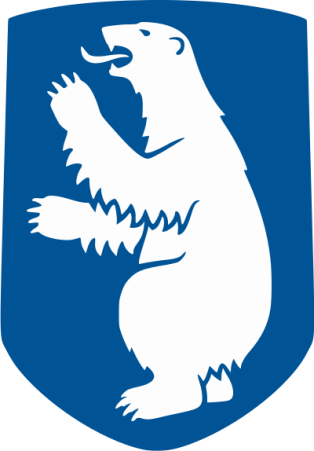 The Bear of Greenland can be found throughout the world in the coat or arms, flags and great seals of numerous cantons, countries, popes and states, including but not limited to: Catholic Church: coat of arms of Pope Benedict XIII; and the coat of arms of Pope Benedict XVI; Germany: coat of arms of Berlin; Greenland: coat of arms of Greenland; Russia: coat of arms of Perm Krai; coat of arms of Yaroslavl Oblast; and the flag of Yaroslavl Oblast; Spain: coat of arms of Madrid; Switzerland: coat of arms of Appenzell; and the coat of arms of the Bern; and the United States: coat of arms of Missouri, flag of California; flag of Missouri, great seal of California; and the great seal of Missouri. 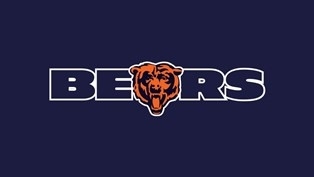 Tributes to the Bear of Greenland, the term “Bear”, or terms containing the consonants of “B” and “R” (e.g., beer) are found throughout popular culture, including but not limited to: Athletes: Charles Barkley (NBA); Kareem Abdul-Jabbar (NBA); Kobe Bryant (NBA); Larry Bird (NBA); LeBron James (NBA); and Tom Brady (NFL); Calendar: month of February; month of September; month of October; month of November; and month of December; Celebrities: Brad Pitt; Bruno Mars; Julia Roberts; Justin Bieber; Justin Timberlake; Mark Wahlberg; Pierce Brosnan; Robert DeNiro; Robert Pattinson; and Steven Spielberg; Coaches: Bear Bryant; and Vince Lombardi, for which the Super Bowl Trophy is named after; Computing: Cyber-attacks, digital attacks that can be launched from anywhere in the world; Corporations: Barclays; Bayer; Behr; Blackberry; Braun; Bridgestone; Brinks; Burberry; Burger King; Burlington Northern; Burton; Halliburton; KBR; Lamborghini; Marlboro; Subaru; and Julius Bar; Cities: Barcelona, Spain; Beirut, Lebanon; Berkeley, California; Berlin, Germany; Bern, Switzerland; Birmingham, Alabama; Birmingham, England; Bristol, Connecticut; Brooklyn, New York; Burbank, California; and Pittsburgh, Pennsylvania; Culture: “White man’s burden”; Financial Markets: Barrel of oil; Bear Market; Gold bar; Stock broker; Inventors: Albert Einstein; and Johan Guttenberg; Legal: Bar Association; Mascots: Baylor University Bears; Brown University Bears; the Chicago Bears; the Chicago Cubs; the Memphis Grizzlies; Mercer University Bears; Missouri State University Bears; Morgan State University Bears; Oakland University Golden Grizzlies; University of California at Berkeley Golden Bears; University of Northern Colorado Bears; University of Maine Black Bears; and University of Montana Grizzlies; Military: Ft. Bragg; Green Berets are worn by special forces military in the Australian, French and Dutch commandos, as well as the United States Army Special Forces; Places: Bahrain; Barbados; Bering Strait; Bermuda; Bermuda Triangle; Bora Bora; Bourbon Street; Brazil; Brunei; Burkina Faso; Burma; Burundi; Great Britain; Liberia; Luxembourg; Nebraska; and Siberia; Politicians: Barack Obama (President of the U.S.); Ehud Barak (Prime Minister of Israel); Gordon Brown (UK Prime Minister); John O. Brennan (Director of CIA); and Silvio Berlusconi (Prime Minister of Italy); Politics: Brady Bill (Brady Handgun Violence Prevention Act); the 2nd Amendment and the “Right to keep and bear arms”; Religion: Abraham, founding father or Israel; Barabbas; Bartholomew; Bereishit, the first book in the Jewish Bible; Sports Franchises: Atlanta Braves; FC Bayern Munich; and FC Barcelona; Toys: Care Bears; and teddy bear; Television: The Borg of Star Trek; Television Anchors: Brian Williams (NBC); Chris Berman (ESPN); and Tom Brokaw (NBC); Witchcraft: Abracadabra, an incantation used as a magic word in stage magic tricks; and Words: aberration; abortion; abroad; algebra; amber; Amber Alert; Aurora Borealis; bar; barb; barb wire; barber; bare; bare foot; bargain; barge; bark; barn; baron; barracuda; bear, bear arms; bear down; beard; beer; beret hat; berries; berry, bird; birth; birthday; board; border; bore; boring; born; borrow; bourbon; bra; brace; brackets; Braham Bull; braid; brail; bran; branch; brand; brand new; brandy; brass; brat; brave; brawl; brawn, BRB; breach; break; breakfast; breast; breath; bread; breed; brew; briar; bridge; brie cheese; brief; bright; bring; brink; britches; broccoli; broil; bronze; broom; brother; brow; brown; brunch; brush; brutal; bur; bureau; bureaucracy; burgundy; burglar; burka; burn; burrito; caliber; candy bar; celebrate; cyber; embarrassed; eye brow; labor; laboratory; liberty; library; lumbar; neighbor; number; robbery; rubber; side burns; somber; starboard; and suburban. There are at least 65 one-eyed creatures in mythology, religion and fiction, all tribute to the one-eyed Beast of Greenland. These include but are not limited to: Agent Pleakley: Agent Pleakley, a one-eyed creature in in the film “Lilo & Stitch” (2002); Ahgg: Ahgg, the witches' giant spider with one eye in the center of his forehead in “My Little Pony: The Movie” (1986); Ahriman: Ahriman, a species of monster from the Japanese role-playing game series "Final Fantasy" (1987); Alpha Centauri: Alpha Centauri, green hermaphrodite hexapod with one huge eye in the “Doctor Who” episode "The Curse of Peladon" (1972); Arimaspi: Arimaspi or Arimaspoi, a legendary people of northern Scythia that were "always at war with their neighbors" and stealing gold from griffins. They had a single eye in the center of the forehead; Balor: Balor, a figure from Irish mythology who was known for his evil eye that could kill just by looking at you. It was prophesied that he would be killed by his grandson, so he attempted to murder his grandchildren; Basilisk: Basilisk, large one-eyed mutant in Marvel Comics' “New X-Men” (2004-2008); Big Billy: Big Billy, a one-eyed creature in “The PowerPuff Girls” (1998-2005) episode entitled "School House Rocked"; Big Dan T.: Big Dan T., a character in the Coen Brothers film “O Brother, Where Art Thou” (2000), who is intended to emulate the Cyclops from Homer's "Odyssey; B.O.B. : B.O.B. (Bicarbonate Ostylezene Benzoate), gelatinous one-eyed creature in “Monsters vs. Aliens” (2009); Bongo Bongo: Bongo Bongo, a one-eyed creature from the “Legend of Zelda” (1986-2014); Cyclops: Cyclops, a race of giants in Greek and Roman mythology, including Polyphemus. They had a single eye in the center of the forehead; Cyclops, one-eyed creatures in monsters in the popular Japanese role-playing game series "Dragon Quest" (1986); Cyclops, one-eyed creatures in the film “The 7th Voyage of Sinbad” (1958); Cyclops, one-eyed creatures in the role-playing game “Dungeons and Dragons” (1974-Present); and Cyclops, Tyson, Percy Jackson's one-eyed half-brother in “Percy Jackson and the Olympians” (2005-2009); Cyclopskin: Cyclopskin, one-eyed creatures in the role-playing game “Dungeons and Dragons” (1974-Present); Cylon Centurions: Cylon Centurions, one-eyed creatures in the sci-fi franchise “Battlestar Galactica” (1978); Dajjal: Dajjal, the anti-Christ in the Islamic religion that only has one eye; Dalek Sec: Dalek Sec, monster that became a one-eyed Dalek-human hybrid in “Doctor Who” (1963-1989); Darklops Zero: Darklops Zero, prototype of Darklops in the film “Ultraman Zero: The Revenge of Belial” (2010); Draken: Draken, a one-eyed sea monster in animated series “Jumanji (1996-1999); Drethdock: Drethdock, a one-eyed creature from the Sega Saturn game “Battle Monsters” (1995); Dusclops: Dusclops, a one-eyed ghost in Pokémon (1996-Present); Dusknoir: Dusknoir, a one-eyed ghost in Pokémon (1996-Present); Duskull: Duskull, a one-eyed ghost in Pokémon (1996-Present); Evil Eye: Evil Eye, a one-eyed monster in the online RPG “MapleStory” (2003); Gohma: Gohma, a one-eyed creature from the “Legend of Zelda” (1986-2014); Graeae: The Graeae, three witches (or sisters) that shared one eye and one tooth between them; Hagen: Hagen or Högni, a Burgundian warrior in German and Norse legend that is depicted in some accounts as having only one eye; Hitotsume-kozō: Hitotsume-kozō, monsters (obake) in Japanese folklore. They had a single giant eye in the center of their face; Imbra: Imbra, a one-eyed idol and the highest god of Kafiristan in the novella “The Man Who Would Be King” (1888); Jian: Jian, a bird in Chinese mythology with only one eye and one wing. A pair of such birds were dependent on each other and inseparable; Kabandha: Kabandha, a demon with no head, no neck, one large eye on the breast, and a mouth on the stomach. Kabandha appears in Hindu mythology as a character of Ramayana; Kang and Kodos: Kang and Kodos, a recurring one-eyed alien duo in the “The Simpsons” (1989-Present); Kerack: Kerack, alien race resembling large one-eyed prawns in novel “Camelot 30K” (1983); Leela: Leela, a one-eyed mutant character in the animated series “Futurama” (1999-2013); Likho: Likho, a one-eyed creature that’s the embodiment of evil fate and misfortune in Slavic mythology; Mike Wazowski: Mike Wazowski, round monster with one large eye in the film “Monsters, Inc.” (2001); Minions: Minions, one-eyed comic henchmen in the animation “Despicable Me” (2010); Monoids: Monoids, a one-eyed alien race in the “Doctor Who” episode "The Ark" (1966); Morris: Morris, a one-eyed mutant character in the animated series “Futurama” (1999-2013); Munda: Munda, a one-eyed mutant character in the animated series “Futurama” (1999-2013); Muno: Muno, a one-eyed creature in the children's television series “Yo Gabba Gabba!” (2007-Present); Naga: Naga, a one-eyed mutant in the film “World Without End” (1956); Ojáncanu: Ojáncanu, a one-eyed giant with long beard and red hair of Cantabrian mythology who embodies evil, cruelty and brutality; One-Eye: One-Eye, one of three sisters in the Brothers Grimm fairy tale "One-Eye, Two-Eyes, and Three-Eyes" (c. 1889); One-Eyed: One-Eyed, starfish-shaped aliens from the planet Paira in the “Warning from Space” (1956); One-Eyed Monster: One-Eyed Monster, the antagonist in the film “One-Eyed Monster” (2008); Orb: Orb, a one-eyed Marvel Comics super-villain, the primary adversary of Ghost Rider; Psoglav: Psoglav, a one-eyed dog-headed monster in Serbian mythology; Purple People Eater: Purple People Eater, a one-eyed creature in the song “Purple People Eater” (1958); Ravage: Ravage, a one-eyed panther-like Decepticon in the film “Revenge of the Fallen” (2009); Sauron: Sauron, the eponymous arch-villain of “The Lord of the Rings” (1954-1955), often manifests as 'the Eye' in Peter Jackson's adaptations of Tolkien's work; Scaroth: Scaroth, a one-eyed time-travelling alien in the “Doctor Who” episode “City of Death” (1979); Sgt. Psyclopps: Sgt. Psyclopps, the one-eyed guitarist for the costumed comedy punk band The Radioactive Chicken Heads; Sheldon Plankton: Sheldon Plankton, a one-eyed creature in “SpongeBob SquarePants” (1999-Present); Shuma-Gorath: Shuma-Gorath, a giant eye with tentacles, in the Marvel comics universe; Starro the Conqueror: Starro the Conqueror, a one-eyed supervillain in DC Comics; Suezo: Suezo, a one-eyed, one-footed breed of monster in video game/anime series “Monster Rancher” (1997); Tepegoz: Tepegoz, a one-eyed ogre in Oghuz Turkish epic Book of Dede Korkut; The Wicked Witch of the West: The Wicked Witch of the West, a one-eyed witch from "The Wonderful Wizard of Oz" (1900); Vaati: Vaati, a one-eyed creature from the “Legend of Zelda” (1986-2014); Waddle Doo: Waddle Doo, a one-eyed creature from Nintendo game franchise “Kirby” (1992-2014); Wenlock and Mandeville: Wenlock and Mandeville, the one-eyed mascot from the London 2012 Olympics; Zargon: Zargon, a giant one-eyed monster in the role-playing game “Dungeons & Dragons” (1974-Present); and Zatar the Alien: Zatar the Alien, a one-eyed green alien in the MTV series “Celebrity Deathmatch” (1998-2007). The “Borg” of Star Trek are an allegorical metaphor for the Greco-Roman Empire in Greenland which rules the world via the Babylon System. The Borg refers to a fictional alien race that appears as recurring antagonists within the Star Trek franchise. The Borg is a species that have been turned into cybernetic organisms functioning as drones of the Collective, or the hive. The Borg force other species into their collective and connect them to "the hive mind", an act called assimilation. Similar to fascism, this process entails violence, abductions, and injections of cybernetic implants. The Borg are infamous for their phrase, "You will be assimilated". This mantra is evident today as all those who do not assimilate into the capitalistic Babylon System are ultimately destroyed, economically or physically. 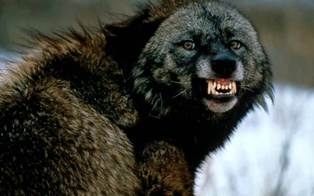 Because Greenland is geographically shaped like the head of a wolf, numerous references to wolfs are found through mythology and popular culture. The term “M. canina” meaning “werewolf”, is a mythological human who has the ability to shapeshift into a wolf or a wolf-like creature, either purposely or after being placed under a curse. The term “canina” is a direct reference to Canaan (i.e., Greenland), home of the werewolf. “The Boy Who Cried Wolf” is one of Aesop's Fables where the idiom to "cry wolf", meaning to give a false alarm, was ultimately derived from. To “cry wolf” was likely derived in respect to attacks emanating from Greenland (e.g., Greco-Roman Vikings). Another idiom “keep the wolf from the door” was also likely derived in respect to the Wolf of Greenland. 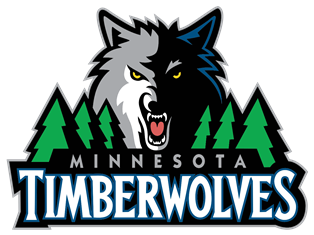 In the language of German, the number “12” is pronounced “zwölf” which equates to “Zion Wolf”, a reference to Mt. Zion in Greenland. The book "Little Red Riding Hood" is a European fairy tale about a young girl and a Big Bad Wolf, a metaphor for Greenland. The story revolves around a girl called Little Red Riding Hood (i.e., the Roman Empire), after the red hooded cape and cloak that she wears. Lastly, Beowulf is an Old English heroic epic poem set in Scandinavia which is commonly cited as one of the most important works of Anglo-Saxon literature. Mascot-related tributes to the Wolf of Greenland are found throughout the world, including but are not limited to: Australia: Brisbane Wolves FC, a soccer team; South Coast Wolves Football Club, or "Wollongong Wolves," a football team; Western Wolves FC, a football team; and Windsor Wolves, a rugby team; Belgium: La Louvière Wolves, an American football team; Canada: Akwesasne Wolves, a hockey team; La Tuque Wolves, a hockey team; Ottawa Wolves RFC, a rugby team; Ripley Wolves, a hockey team; Shelburne Wolves, a hockey team; St. Catharines Wolves, a soccer team; Sudbury Wolves, a team in the Ontario Hockey League; Sudbury Jr. Wolves, a team in the Northern Ontario Junior Hockey League; and Sudbury Wolves (EPHL), a defunct team in the Eastern Professional Hockey League; England: Walthamstow Wolves, a speedway team; Warrington Wolves, a rugby league team; Wolverhampton Wanderers F.C., a football team commonly known as "Wolves"; and Worcester Wolves, a basketball team; Indonesia: Tangerang Wolves FC, a football team; Ireland: Dublin Wolves, an ice hockey team; Nigeria: Warri Wolves F.C., a soccer team; Pakistan: Faisalabad Wolves, a cricket team; Scotland: Edinburgh Wolves, a Scottish American Football team; Sri Lanka: Wayamba Wolves, a cricket team; Switzerland: EHL Wolves, a Swiss ice hockey team; and the United States: American Wolves, a wrestling team; Chicago Wolves, a minor league ice hockey team; Carolina Raging Wolves, a football team; Connecticut Wolves, a hockey team; Detroit Wolves, a baseball team; Idaho Wolves, a soccer team; Los Angeles Wolves, a former professional soccer team; Manchester Wolves, a minor league arena football team; Minnesota Timberwolves, an NBA basketball team; North Carolina State University Wolfpack, sports teams of North Carolina State University; Stockton Wolves, an arena football team; Stony Brook University Seawolves, sports teams of Stony Brook University; University of Nevada Wolf Pack, sports teams of University of Nevada; and the Wisconsin Wolves, a football team. The story of Romulusand Remus is historically purported to be Rome's foundation myth. However, evidence suggests that it is an allegorical metaphor for the birth of the Greco-Roman Empire in Greenland (Romulus) and the death of the Roman Empire in the underworld (Remus). According to legend, the twins’ mother was Rhea Silvia who conceived Romulus and Remus by the god Mars or Hercules. Shortly after the twins were born, she abandoned them to die in the river Tiber but they were saved by a miraculous intervention (i.e., the discovery of Greenland). The river carried the twins to safety where a she-wolf named Lupa (i.e., Greenland) found them and suckled them. When Romulus and Remus discovered the truth of their birth, they chose to found a new city (i.e., Atlantis, Greenland). Romulus wanted to found the new city on Palatine Hill but Remus preferred Aventine Hill. An argument ensued and Romulus killed Remus with a stone (Greenland is known as the “Rock of Ages”). Romulus founds the new capital city and names it Rome. However, in time, Romulus (Greenland) becomes increasingly autocratic and disappears or dies under mysterious circumstances. In later forms of the myth, Romulus ascends to heaven (i.e., the “haven” of Greenland), and is identified with Quirinus, the divine personification of the Roman people. 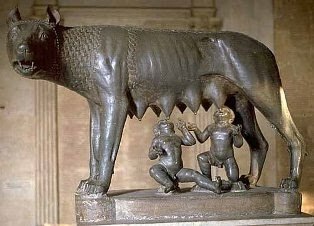 The Romulus and Remus myth is perpetuated by a bronze statue entitled the Capitoline Wolf which depicts the she-wolf suckling twin infants. Since 1471, the Capitoline Wolf has been housed in the Palazzo dei Conservatori on the Campidoglio which is located on Capitoline Hill in Babylon, Rome (i.e., Rome, Italy). Because Greenland is geographically shaped like the head of a fox, numerous references to foxes are found through mythology and popular culture. The word “Fox” (F+X) acronymically and/or consonantly equates to “Double Cross North” or “Pi kills” as Pi is an acronym for Greenland. The idiom “sly as a fox” is indicative of the Greenland’s behavior while the term “fix” is slang for “fox”, meaning to make right, firm, stable, or stationary. Corporate entities (e.g., 20th Century Fox, Firefox, Fox News Channel, and FX) as well as films such as Disney’s “The Fox and the Hound” (1981) all contain fox-related titles and imagery. Interestingly, a white fox is depicted in the coat of arms of the Northwest Territories of Canada which border Greenland. of or notice to the creator for all NONPROFIT academic and educational purposes (Swiss Federal Copyright Act of 1992).